When PfAP2-G is stabilized in early asexual parasites, some of them develop into multinucleated schizonts (multiple nuclei show in blue), as expected according to the previous model, but some convert into gametocytes (expressing markers shown in red and green) within the same cycle. Credit: Bancells et al. 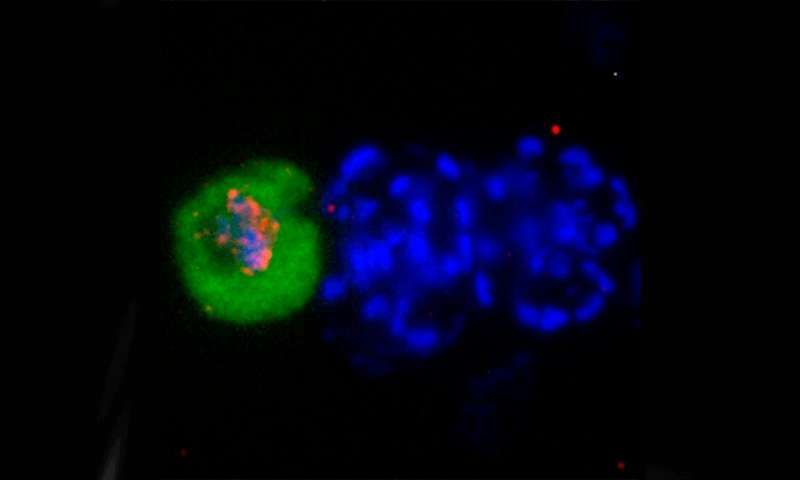 A study led by the Barcelona Institute for Global Health (ISGlobal) reveals a new mechanism by which the malaria parasite Plasmodium falciparum converts from its asexual to its sexual form, which can be transmitted to the mosquito. The results, published in Nature Microbiology, provide important information on the parasite's lifecycle and will eventually contribute to design strategies aimed at stopping its transmission. Human-to-mosquito transmission of the malaria parasite requires that some parasites in the blood stop replicating asexually and convert into sexual forms called gametocytes. This sexual conversion represents therefore an ideal target for stopping parasite transmission. However, the molecular mechanisms by which this process occurs remain poorly characterized. Alfred Cortés, ICREA researcher at ISGlobal, and his team used a protein that is expressed only when the cell decides to differentiate into a gametocyte —a moment when it is indistinguishable from the asexual phase. Using the CRISPR-Cas9 gene editing technique, they labeled this protein, called PfAP2-G, with a green fluorochrome, and re-examined the hypothesis that, between cell commitment and sexual conversion, the parasite needs to undergo a replication cycle. Using a culture system in the lab, the team found that some parasites directly convert into gametocytes, without an additional replication cycle. "The point at which the parasite decides to become a gametocyte turned out to be earlier than previously thought," explains Cortés. "In fact, although its life cycle was described more than 100 years ago, it continues surprising us," he adds. "Our results indicate that those parasites activating the expression of PfAP2-G early enough during the cycle can take the rapid route, whereas the others need to go through a replication cycle before converting into gametocytes," explains first author Cristina Bancells. "This rapid route could favor the parasite's survival and transmission in a 'dangerous' situation, for example, in the case of drug treatment," she adds. For the authors, these results provide an extended model for the early steps of sexual differentiation in P. falciparum. They also point to the need for further studies to establish how often parasites use one or the other sexual conversion pathway (classical versus "express") in vivo. "Of note, gametocytes are a priority target for public health interventions aimed at reducing malaria transmission, and eventually eliminating it," says Cortés.